For over a year now I've been writing a monthly article for the Town Talk's Guest Pastor column. Typically it runs on the first Sunday of the month, but this month the first Sunday was also the first day of the month and I didn't get it to them in time to run so it ran on the 2nd Sunday, today, October 8. Also, typically I share the article on Facebook, but a friend told me since he's not a subscriber, he can't read the article. So, in the interest of sharing with everyone, below is my October edition of the Guest Pastor column. Enjoy! Modern translations more accurately translate the last part of that verse as “nothing can make them stumble.” That’s a great promise to those who love God’s Word, that by loving it they will be kept from stumbling into sin, error, heresy or damnation. However, there’s something quaint about the old King James Version translation when it says that “nothing shall offend them.” And it seems like it’s a message that is sorely needed in this 21st century! We live in a time when it seems it is almost a hobby to be offended! Every news commentary show seems to have blowhards on opposite sides of the issue just waiting to be “personally offended” at what the other person says! Our politicians are at loggerheads because everyone on one side of the aisle has either offended or been offended by someone on the other side of the aisle. Even our churches are not immune the disease of “easily offenditis.” Someone sits in our pew, nobody called us when we missed a Sunday, the church talks about money too much, the pastor’s wife won’t help in the nursery, the sermons are too long, too boring, too convicting, too personal, too irreverent, too “fill in the blank.” You name it, someone’s gotten offended by it – and probably started another church down the street because of it! Opportunities to be offended abound, especially in our hyper-connected culture. Arguments break out online faster than the speed of light, it seems! But what if we, as Christians, were to slow down and actually listen to each other? What if rather than only listening so we can make a rebuttal we listen so we can hear the hurt, the anguish, the lament bound up in the heart of the other? What if rather than being offended, we actually heard what was in their heart? I’m convinced that people are longing to be heard. Many marriage conflicts could be avoided if just one of the partners would stop trying to be right and listen to their spouse! But no, because we want to be heard, we charge ahead like a bull in a china shop, making our point, getting the last word, winning the argument … and losing respect, love, affection, intimacy, and maybe even our marriage. It is possible to win the battle and still lose the war. Truthfully, being offended is a choice we make. We can’t stop the inconsiderate, rude, offensive acts of others. But we don’t have to hang them on our refrigerators either and rehearse them every day! If we are offended by something, we’ve chosen to build a monument to it and we tie ourselves to that moment in time. And we are stuck! I believe we can choose to not be offended. I believe we can choose to overlook an offense. I believe we can choose to ignore an insult. Otherwise the Scriptures wouldn’t have told us to do those things! 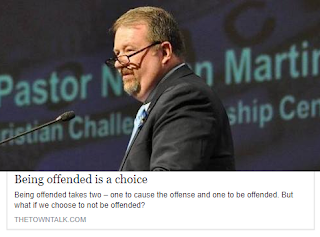 Being offended takes two – one to cause the offense and one to be offended. But what if we choose to not be offended? What if we choose to follow the words of Paul when he said, “If possible, so far as it depends on you, be at peace with all men.” (Romans 12:18 NASB) I choose peace over being offended. How about you?